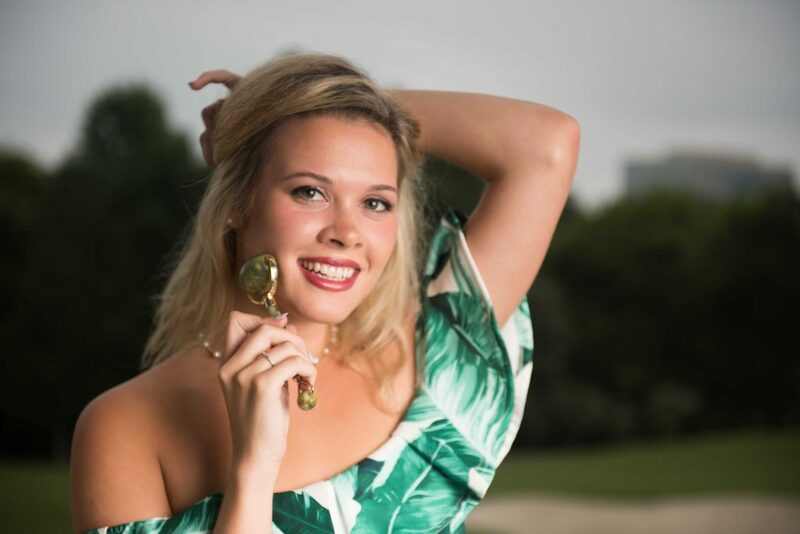 Leila Carter is the founder of Jade Roller Beauty an entrepreneur from Pittsburgh who has worked at some of the best organic spas on the East Coast. At 17, she had her first job in the spa industry managing day-to-day operations at a 4-story, 7-room day spa (massages + facials). 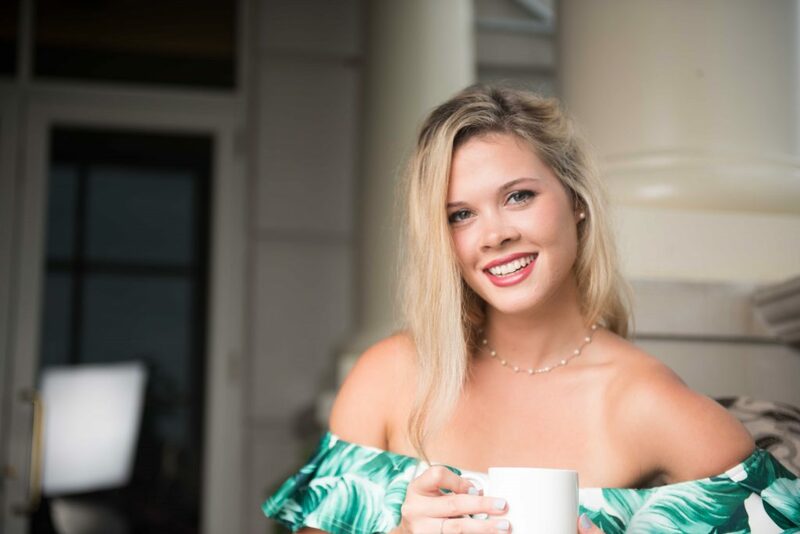 After falling in love with skin care and spa management, she began to study everything from organics, to medical and legal aspects of the industry. Leila found her niche in organics when she worked as the Community Outreach Director for an upscale day spa in South Park, Charlotte, NC. Leila’s personal values aligned in solving her own skincare concerns. She was able remove a forehead lesion which would not disappear for 5 months! After endlessly trying grocery store cleaners to solve the activity, she went to the doctor. Combining the natural approach to her own skin care with jade rolling to remove toxins, she healed the unsightly bump that would not go away for so long. 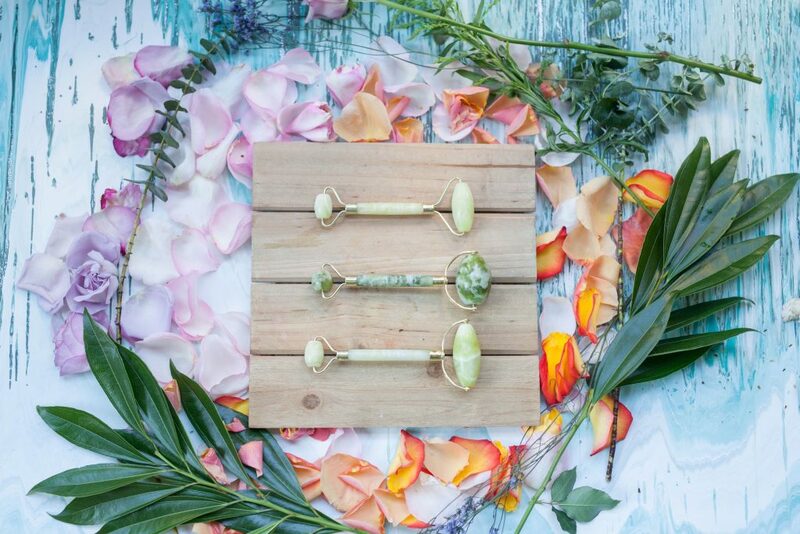 Through in-depth studies of medical and organic spa trends and ancient beauty practices, Leila found the Jade Roller. After seeing the benefits on her own skin, she decided to bring Jade Rollers to the day spa where she worked. The owner, who has 10+ years experience in the industry, was convinced of the benefits after just a few days of compounded usage. Her vote of confidence in the Jade Roller was exactly what Leila needed to fuel this new business venture. “I let her borrow my product and each day I was without my roller, I noticed Caci’s (spa owner) skin was glowing with a youthful radiance. 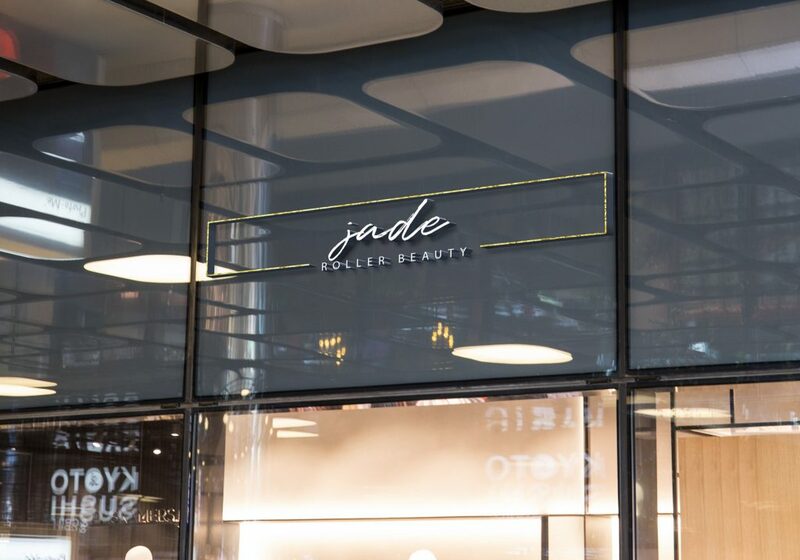 Spa it Girl caught up exclusively with Leila Carter, founder of Jade Roller Beauty – Spa and Wellness Industry #GIRLBOSS Inspiration to find out more about her and her Jade Roller Beauty. Q: What inspired you to start Jade Roller Beauty? I have directed some of the best organic spas on the East Coast, USA in both Shadyside, PA and Charlotte, NC. And my first job was managing a 4-story wellness spa at 17. I knew I was meant to go big in this industry. I fell in love with skin care through in-depth studies of organic spa trends, along with ancient beauty practices. It was through research in preparation for opening my future spa that I found the Jade Roller, and I stumbled upon it at the perfect time. Just as I discovered jade rolling, I had a lesion (mole) on my forehead that didn’t disappear for 5+ weeks! Thinking it wouldn’t ever go away, I knew I had to do something drastic, so I turned to my dermatologist. He suggested a pill, and when I did more research on it’s risks, something didn’t sit right with me. Healthline.com says Doxycyclin “may cause intracranial hypertension, or high blood pressure inside your skull. Symptoms may include headache, blurry vision, double vision, and vision loss.” Vision loss?! You’ve gotta be kidding me. There has to be a better option! I took a step back to gain perspective. Rather than filling that Rx, I switched all of my skin care products to organic, and I remembered that little jade tool that I saw online. I quickly ordered one, and when it arrived to my house it was like Christmas morning. I started jade rolling to revitalize my skin’s natural ability to fight the lesion through promoting the removal of toxins via lymphatic drainage. I used this in combination with Eminence’s Clear Skin Probiotic Masque, which is known for helping to reduce lesions. Joy! I was effectively able to shrink the lesion within a week’s time, and it is non-existent today. After seeing the benefits on my own skin, I loved the way jade rolling instantly smoothed the fine lines, which were appearing on my forehead after 21 years of sun exposure. Applying my favorite serums and jade rolling after became my new favorite self-care ritual, and made me feel like I had access to a fountain of youth. I dove into research. Realizing the medicinal origin of jade rolling, I was intrigued. This was not just a beauty tool, but a wellness tool to promote holistic healing from a culture which places emphasis on the lymph system as it related to total body health- a critical integration which western medicine largely ignores. I committed to my vision of bringing Jade Rollers to market; I was determined to share this ancient beauty technology with everyone who would lend an ear. However, the ones offered currently did not live up to my standards. I fell in love with a cheaper version, which broke on her after a week and a half of use. Knowing that Estheticians deserved better, I set out to find a better quality construction and envisioned my brand. Not only did I gain a vote of confidence from spa owners, but since establishing JADE, Holistic Estheticians all over the world are taking note of the benefits that JRB rollers can have on their complexion, incorporating it into the core of their practice and retailing at their own spas. This was my break-through, realizing that spa owners, estheticians, beauty industry experts, and every day people who appreciate natural beauty love this product as soon as they get to try it. Effects are instant and compounding! It is amazing that you can now find our rollers at the most innovative organic spas and in the hands of green-beauty conscious individuals all over the world. We are a beauty start-up, which is literally taking off from the best place, with incredible people in the industry backing our products. Q: What does a Jade Roller actually do? We are the best ancient skin care technology. Non-invasive, rooted in medicinal efficacy, on the go, and luxurious. We will entirely shift the way you look at skin care, from a necessity to a self-care ritual. You work out your body, but not your face. Just like working out, Jade rolling can offer esthetic and health benefits. Jade rolling feels like a deep tissue, relaxing facial massage which helps to drain lymphatic fluid that is held stagnant beneath the tissue. This fluid acts as a “bath water” of sorts for the cells, refreshing and replenishing nutrients. But if the lymph system is not in motion, this fluid can hold onto toxins, and tension held in our face by jaw clenching and every day facial expressions from stressors are causing blockages. Jade rolling gets things moving again, opening these blockages and aligning the system to boost circulation, cell turnover, and promote healing, holistically. By allowing the facial tissue to deeply relax, we can move this fluid out and detox, smooth fine lines and wrinkles, and many clients explain their jade experience as “uplifting” for their cheekbones and jawline, and “brightening” for their complexion. Clients will see INSTANT and COMPOUNDING results with jade rolling. It will improve the penetration of any serum it is rolled over top of, due to trapping the ingredients closer to the skin while we increase circulation. We also align the meridian system and balance chi by jade rolling, and effects are brought about by both the act of rolling and the stone itself. Q: Why use a Jade Stone? Jade is known as a healing stone and was used since the 7th century and originated in TCM, to be reserved for the Chinese elite. 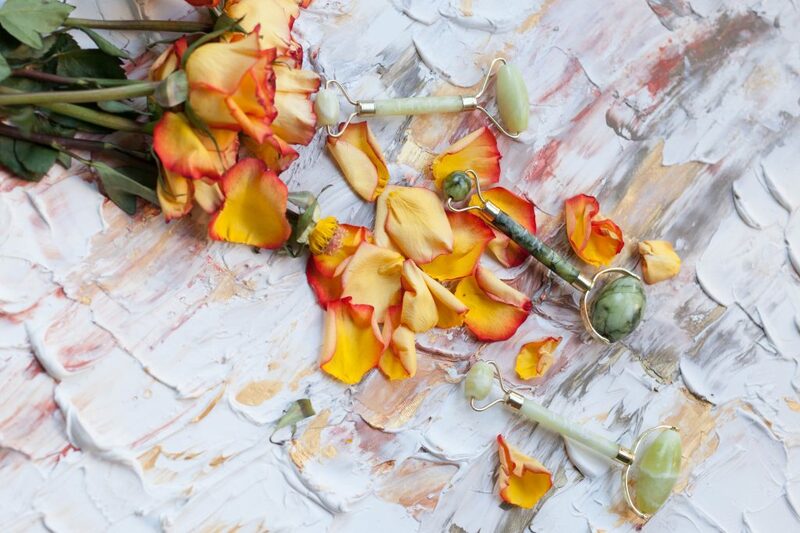 Yellow and olive colored stone of jade is said to calm, and we encourage outside research on jade as it relates to uses in healing in Traditional Chinese Medicine, manual lymph drainage, and meridian system. Due to its healing properties, there are quotes stating “you can put a price on gold and silver, but you cannot put a price on jade. Q: How do you use your Jade Roller Beauty? Daily in the morning and at night. Roll it up and out, following a provided guide and informative videos. It is so simple yet relaxing! You will want to roll it on the face after you cleanse, or over your favorite serum or moisturizer. The purpose is to bring us into the present moment of self-care and to promote anti-aging benefits along with realigning the system for revitalized health. We will always be moving in a direction to counteract gravity’s effects. You can watch a video here: Jaderollerbeauty.com/history As we roll, we are draining lymph fluid by following the lymph pathways, connecting energy between the meridian points to balance chi and stimulate meridian flow between the chakras. General cleanse exfoliation and then serum or moisturizer. Boosting circulation like a workout for the face you will see an instant flush, contouring effect, and cheekbones uplifted. Headache relief. On the go. Easy to travel with. Q: How do you clean it? With a cloth which we include at no additional cost as an accessory. Jade is a non-porous stone and does not harbor bacteria. Some estheticians use vinegar. We encourage disinfecting naturally, and you can use an olive or grapeseed oil to lubricate the roller as needed. Q: Do you think it’s great for Anti-ageing? Yes! It promotes collagen production. Promotes elastin to be built and stretches it, building resiliency. Your skin never stops producing collagen, but production piques collagen at the age of 25 years old. In anti-aging, prevention is key, and we are truly a product for anyone who is focused on natural beauty solutions. I believe in the efficacy of the product so much because I see the result on myself. I am 21 years old and just starting to see my first few expression lines, so having this beauty tool in my life right now is setting me up to age more gracefully than if I had never found jade. The earlier you start, the better as effects are compounding. It is more gentle than manual exfoliation to promote cell turnover. Unlike manual exfoliation with beads on the skin, jade rolling gets the facial tissue and muscles involved, holistically benefitting the system. A lot of aging in our face has to do with blockages caused by holding tension. Jade rolling naturally relieves these blockages and revitalizes the skin with life energy. Q: What is your own Skincare Routine? I see my entire skin care practice as self-care ritual. First, I do a two-step cleanse. I follow the idea of “like begets like”, and since I have combination dry/oily skin, I use Pure Stella cleansing oil to break up some of that residual surface oil. My next cleanser is an Indie Lee brightening cleanser + Eminence organic stone crop fizzofoliant (3x weekly). These both offer great benefits to slew off any surface cells, but I only need the extra “grit” of the fizzofoliant every other day. I let these sit for a minute so the brightening effects of the masque can take effect. Then I use a hot washcloth, and I am now ready for my Masque. I apply Eminence’s Probiotic masque on my acne-prone chin and forehead which needs hydration. I pair that with an Indie Lee clarifying masque on my nose and T-zone, because my oily skin leads to blackheads otherwise. By targeting the areas of my face with different masques based on my desired result, I can custom-tailor my treatment to be the most effective for my skin type. I wait a couple minutes for the ingredients to sit, then mist my face with Mario Badescu rose water spray, and jade roll with my SPA roller to increase the penetration of the masques. By trapping the ingredients next to the skin, we will see better absorption. The cells of the dermis tissue lie directionally like shingles on a roof, so jade rolling upwards in the opposite direction of gravity is best. It feels like a deep tissue massage and the masque begins to feel even more cooling. I use a hot towel to remove the masques, and follow with a Laurel WPO antioxidant serum and a Hyaluronic acid serum. Hyaluronic acid has a plumping effect and allows the cell to retain up to 1,000 times its weight in water. I jade roll over my serums with my Jade Roller PRO. This model is shaped like a rolling pin, providing for a gentler roll, helping serum infusion, the PRO will have a more distributed pressure than the SPA. I finish up with lip and eye treatment. Hyaluronic Acid is commonly injected as lip filler. In an alternative method, I will exfoliate my lips with a natural sugar scrub, then let the HA sit on my lips for an instant, non-invasive plump. The small abrasions that you make with the sugar absorb the HA, which creates that plumped effect. I complete the whole ritual with a Sahajan Ayurvedic eye cream and light a candle. I finish my routine by thanking myself for taking the time to care for myself, by thanking the world for running water, and for this beautiful life that I live. Sometimes I will follow a facial with essential oil scent therapy. Q: What are your Favorite Spa’s? Rejuvenate Mind Body Soul (Charlotte, NC) – Revision facial with mud mask left me clear and refreshed. Sherri is one of the most knowledgeable Estheticians I know. Ballantyne Spa (Charlotte,NC) – The Organic Journey facial was a moment of “me-time” and featured Eminence products. I saw an Esthetician named David, and he provided me with a deeply exfoliating facial. You can read about the entire facial protocol that I experienced at my blog post here. The Pear Poppyseed Microderm Polisher is the exfoliator to make the difference in that organic facial. His technique was relaxing and thorough and left me with a glowing complexion for days to come. When I have a day to spend relaxing for a special vacation in the Charlotte area, the Ballantyne Spa is my choice. Their indoor and outdoor pool right on the golf course are divine. Grand Sirenis (Akumal, MX) – Tezmezcals from ancient origin to promote wellness. Premiere hydrotherapy treatments. On-site at a resort. Angela Peck (Capitola, CA)– Holistic Skin and Care owner, Gua Sha facials, lymphatic drainage specialist. Also offers natural face-lifting Nefeli white jade facials with jade rolling. Q: How do you find a balance whilst trying to grow your brand and business? I live by my calendar. I’m human, and I still miss appointments and phone calls every now and then, but I have learned to offer myself peace and grace on days when I miss a couple things. I am proud of the strides I make and I have a laser focus on what I want. Sometimes things slip away from all of us, though and it’s okay to ask someone to let you circle-back in a couple hours if you need time to properly address their offer. In fact, they will appreciate that you want to wait until you can fully offer your attention. Having goals concretely in front of you is important, but not being too serious about the path to get there is also. Laugh at yourself! I have mentors and friends who help balance me. Inspiring others to start – whether that be on a new self-care ritual or their own businesses – that helps to keep me going on the wild days. Knowing that I am bringing a product to people that is promoting wellness, and influencing spa culture towards natural solutions for healing feels really good. Hearing people get excited about it never gets old and I fall in love with my products all over again every day. Q: Who are your Wellness, Spiritual, and Spa Inspirations? Guru Ranjit Deora – Owner of Charlotte Meditation. He told me “You should respect each person as a god or a goddess in front of you” I love that. That is the only way we can elevate our collective consciousness is to be open to learning from each other as if they are reading from the book of knowledge itself. Elkhart Tolle – for his practice in present-moment meditation and spreading that knowledge through his written works, including The Power of Now and New Earth. Angela Peck – Lymph-focused facials in Gua Sha, utilising jade tools including JRB rollers and Nefeli Scrapers. She trains in these areas and is extremely knowledgeable in skin care as it relates to holistic health. Laurel Whole Plant Organics – Fosters a mentality for products, which uses the whole-plant for every possible benefit. She specializes in slow beauty and working intimately with small farms from seed to bottle. Joanna Vargas – An aspiration to me. A top NYC spa owner, currently expanding to Los Angeles. Has her own fabulous skin care line and does body treatments for the VS Fashion show models. Drop Mic. Sherri Mcgee – A local inspiration to me in Charlotte and someone who has shared her wealth of knowledge on skin care to lead me to pursue an education at the same place she sought her license. Micro blading trainer and phenomenal facialist. 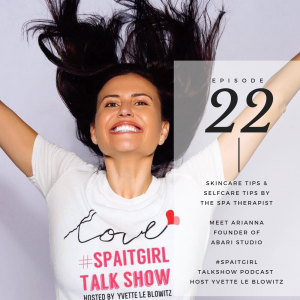 Yvette Le Blowitz – Spa It Girl and inspiration to anyone seeking to further self-love! New author to show women that “it starts with me”, myself, here- now to make a shift towards acceptance. Any woman who is promoting widespread wellness! Can you share any tips on how to feel good from within? If you feel unsettled in something, give yourself permission to feel that way. Life can’t always be perfect, but it is beautiful because it is your life. Stand up for yourself and your right to be at peace. Make being calm a priority. To make self-care a priority because when you take care of your self you are taking care of the planet via the ripple effect. Cry if you need to cry. Smile, laugh, jade roll, and catch up with an old friend, read a book. There is far too much unsettling in this world, and to bring peace to another person is the best gift a human can give to another person. To allow for a safe space for someone to just BE. Even in crisis, you can carry your peace with you and offer it to others. If you had to write some of your own quotes about Jade Roller Beauty what would they be? “It’s about the nail technician who tells me she helped relieve someone of carpal tunnel symptoms during her manicure. It’s about the Esthetician who creates an entire experience around our rollers because she sees the results. Product photos by: Valerie Williams photography. Photo Credit of Lelia Carter: Tim Roller Photography.